Our repertoire is mainly choral mainstream, with a strong emphasis on ecclesiastical works, but there is some variety, particularly for the summer concert, which may feature lighter music and folk songs, and the annual carol concert where the audience joins us in singing a number of well known carols. Clicking on the dates at the head of the following sections will give further details of the concerts performed during those periods. Rufus Frowde joined us as new Musical Director In May 2011, and opened his tenure with the choir with a magnificent performance of Mendelssohn’s Elijah at a St Albans St Cecilia Society Concert in St Albans Abbey on 22 October 2011. The concert received a glowing review by John Manning - read review (© 2011 Herts Advertiser). We were very honoured that Sasha Johnson Manning wrote The Hardynge Seasons based on five seasonal poems specially for us: we gave the first performance in November 2012, accompanied by Matthew Woodward, piano. The concert received a positive review by Neil Buick - read review (© 2012 Herts Advertiser). We were delighted that Sasha Johnson Manning agreed to be our first Honorary President. On 18 October 2014 we gave a joint concert with the Aeolian Singers of Hemel Hempstead in St Albans Abbey. The main work was Beethoven’s Mass in C major. The concerts we have put on during Catherine Beddison’s Directorship, since January 2007 include an exciting performance of Karl Jenkins’ The Armed Man: that concert included Dufay’s Missa L'homme armé, which uses the same C14 popular tune. We have also sung Carter’s Benedicite and Chilcott’s Singing by Numbers, and the piano and harmonium version of Rossini’s Petite Messe Solennelle. We sang The Manchester Carols composed by Sasha Johnson Manning, to poems by Carol Ann Duffy, for the 2010 Carol Concert, under our Interim Music Director, Mark Jordan. This was one of the first performances of this delightful work outside Manchester. Roderick McPhee was Music Director from 1992 to 2006. Highlights of his direction of the choir include well known works such as J S Bach’s Christmas Oratorio, Mozart’s Requiem and Brahms’ Ein Deutsches Requiem, and less well known works such as Britten’s St Nicholas and Rossini’s little known but glorious Messa di Gloria. Also of note was the St Cecilia Festival Society concert in St Albans Abbey on 12 October 2002, in which Rod directed a very exciting performance of Walton’s Belshazzar’s Feast. Our 40th Anniversary Year, the final year of Rod’s Directorship, was marked with two special concerts. Firstly we gave the premier performance of a specially commissioned work, Magnificat, by Philip Tebbs, and the year ended on a high with a glorious performance of Handel’s Messiah (complete) in St Albans Abbey. 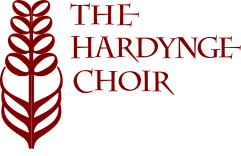 David Ireson founded The Hardynge Choir. His Directorship covered a very wide variety of interesting and popular works, such as Handel’s Messiah, and some which were quite challenging, such as Beethoven’s Mass in C major.